1. Place the butter in a bowl and mix in the garlic, rosemary and parsley. Beat the ingredients together until they are well combined. Place the mix into the fridge for 15 minutes, or until you are ready to use. 2. When ready to serve, heat the oil in a large frying pan over a high heat. When hot, add the prawns and fry without turning for 45 seconds. 3. 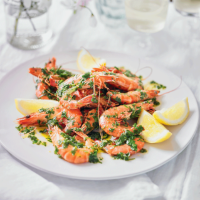 Flip the prawns, reduce the heat to medium and add the garlic butter. 4. Cook just long enough for the butter to fully melt and the prawns are pink and opaque, and cooked through. Serve with chunks of bread and wedges of lemon.